Find the perfect Isuzu car today at Carsnip. We’ve got over 433 used Isuzu vehicles available, and our intuitive search system means that you can make the best decision in the easiest way. We’ve made buying your next car easy. Browse over 433 vehicles below. 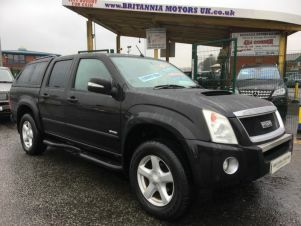 The Japanese brand Isuzu isn’t very common in the UK, but for pickup trucks and SUVs that are reliable, simple workhorses, you can’t do much better. The Rodeo is a pickup which is a prime example of a hardworking, rugged car, ideal for rural use or towing. The Isuzu Trooper, which could be compared to the Mitsubishi shogun, is a great off-road 4x4. Available in a 3.5-litre V6 petrol or a 3.0-litre turbodiesel, four-wheel drive is operated at the touch of a button for when it gets tough. The D-Max, launched in 2012, is their newest offering. Available only with a 2.5-litre turbodiesel, like the rest of the Isuzu range, its practical, strong and rugged.